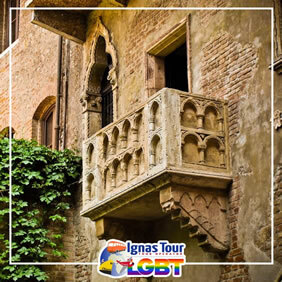 Verona – a UNESCO World Heritage city in northern Italy, known for artistic heritage, operas and plays including William Shakespeare’s "Romeo and Juliet". Roman ruins, medieval vestiges, Venetian and Austrian traces can be seen all across the city, as well as antique palaces, squares, bridges and wonderful churches. In the historical centre, Piazza Bra and the Arena, Piazza Erbe and Piazza dei Signori, Via Cappello and Corso Porta Borsari lead to the Teatro Romano, Ponte Pietra, Castelvecchio, the Ponte Scaligero and the ancient churches of San Fermo and Sant'Anastasia, the Cathedral (Duomo) and San Zeno. Elegant cafés and ancient osterie (typical inns of the Veneto territory), craftsman shops and high couture shops enliven city life all year long. Verona is a man-sized city which fascinates visitors with its elegance and its welcoming atmosphere, in which ancient and modern times meet. Explore this special city with us! 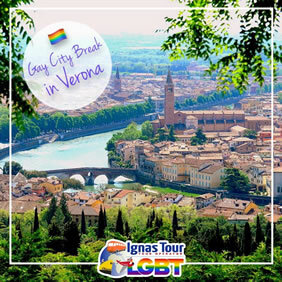 Founded by the Romans in the 1st century A.D., the enchanting city of Verona is dotted with very attractive palazzi, elegant squares, and medieval gems. Architectural remnants of the Roman era are also a real draw, most notably the famous Arena, which is home to a world-renowned summertime opera festival. It is perhaps the best-preserved Roman amphitheater in the world — and the most famous after the Colosseum in Rome. Dubbed the “City of Love,” romance is most definitely in the air in fair Verona. The city’s most famous residents, Romeo and Juliet, seemed to think so anyway. The Basilica San Zeno Maggiore is another wonderful highlight — a very impressive Romanesque-era building with extraordinary artistic creations. 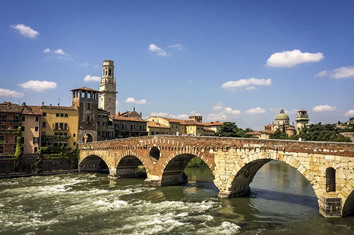 Verona sits on the Adige River which comes tumbling down from the Italian Alps, and indeed just outside the city is hilly terrain and the location of some excellent vineyards, one of which we’ll have the pleasure of visiting to taste their wines. 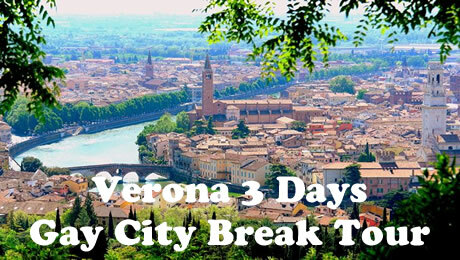 Verona is the perfect city if you want to get away from your daily routine and spend your holidays peacefully with a dash of adventure. It is a small city and the locals are more traditional and warm people. The gay acceptance isn't quite high but as long as you keep a low profile, you will face absolutely no problems. The gay nightlife might not be the most advanced, but considering its size it's very good. There are a couple excellent gay clubs, pubs and cafes where you can spend your nights! For the naughtier travelers, there is a gay cruising sauna which offer a more alternative kind of fun! • Morning walking shared tour with gay friendly guide. • Start on the river bank at Castelvecchio and go through the old Roman Borsari gate. • We will make many discoveries on the way: a Medusa, a couple of enormous ammonites, the weather forecast stone and the birthplace of the Italian national Christmas cake! • Then we arrive at what is probably the oldest, continuously functioning marketplace in the world: the laid-back Piazza Erbe, while next to it, the classy Piazza dei Signori is the living room of the city, with its elegant statues of poets and knights. But... come on, Juliet is waiting! • In the Capulets' house we ponder why Juliet is so immensely more popular than Romeo and we learn what 'Juliet's Club' is. • Our tour ends at the Arena with a “wow” moment: imposing, surprisingly well preserved, solemn and yet very welcoming, our Roman Amphitheatre is the true heart of the city! Day 3 - Verona & Good Bye! Hotel Leon d'Oro has always been synonymous of elegance and hospitality in Verona. The Hotel offers wide open spaces, elegant rooms and high quality technological services. The high attention to the customer together with our highly qualified staff guarantees our guests a perfect stay in every detail. Hotel Leon d'Oro is 1.5 km from Piazza Bra and the Arena, with a round-trip shuttle service during opera evenings. The 4-star Hotel Leon d’Oro is 800 m from Verona Porta Nuova Train Station. This impressive building offers large open spaces and elegant rooms, just a 15-minute walk from the historic centre. Free Wi-Fi is available in all areas. Each room features a satellite flat-screen TV, a minibar and air conditioning. A marble bathroom with a hairdryer and a TV with Sky channels are also available. Some rooms come with luxurious details and a seating area. The Leon d'Oro restaurant is open for lunch and dinner and offers typical local cuisine and a rich wine list. Your daily breakfast includes savouries and pastries, tea and coffee, and a lounge bar is also available. Leon d’Oro Restaurant offers the best italian cooking specialities, revisited in an international key, giving you the possibility to re-discover every taste by the seasonal proposals. Delicious dishes, warm atmosphere, flawless service. The menu à la carte dedicates a special section to the local cooking tradition. Imagine your stay in Verona: to be able to hear the notes of the most important operas, to be immersed in the romantic atmosphere celebrated by Shakespeare and to experience an artistic and cultural panorama of a high level. Offering free high-speed Wi-Fi, Hotel Giulietta e Romeo is just 50 m from the Arena Verona and 200 m from Piazza Brà square. Rooms come with elegant parquet floors, a minibar, and a satellite LCD TV. The Hotel has 38 rooms and all have: direct telephone, LCD TV, free WiFi connection, safe, hairdryer, minibar, independent heating and air conditioning. The rooms are air-conditioned in summer. Each one has a private bathroom with shower and hairdryer. 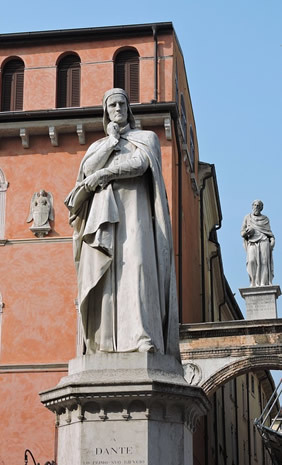 Verona Historical Centre is a great choice for travellers interested in shopping, food and ambience.